Each year, U of I Community Credit Union awards seven college-bound high school seniors a scholarship up to $1,000 based on the Illinois college of their choice. The Orange & Blue Scholarship Program is designed to benefit students who are U of I Community Credit Union members and will be attending the University of Illinois, Parkland College, and other Illinois colleges and universities. Scholarship applications are reviewed by a team of volunteers at the U of I Community Credit Union and are given a score based on the information and documents submitted. Applicants are asked various questions including their favorite activities throughout high school, and any honors or awards they have received. They are also required to submit two letters of recommendation and an essay relating to the benefits of credit unions. 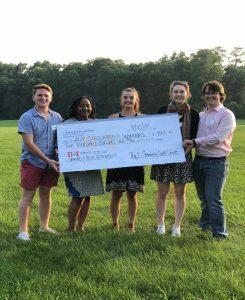 The 2018 Orange & Blue Scholarship winners have been announced and were recognized at the Allerton Park Concert Series on Friday, August 10th. This year’s winners are Gage C (Urbana High School), Mary-Elizabeth G (Urbana High School), Abigail H (Charleston High School), Sharon L (Centennial High School), Hollianne L (Armstrong Township High School), Christie M (Urbana High School), and Lane W (Oakwood High School). We'd like to hear how we can provide you with more helpful information.